Please welcome today's very special guest blogger author Leanore Elliott. You may remember Leanore from her visit here in June when E.J. interviewed her about her upcoming Beasts series. You may read this fun interview here. As part of Friday the 13th Week Leanore agreed to come share with us a true story of one her experiences with the paranormal. Enjoy! The next night, the same thing; hushed conversation, giggles, water running etc. This time, I woke my husband up and made him listen. His eyes narrowed, he got up and crept up to the bathroom while he listened. He threw the door open. Nothing there... He came back to bed. He was silent. “Well?” I asked with fear in my voice. He sighed. “We were both dreaming.” He turned over and went to sleep. Not me, I lay awake listening until the wee hours. I was sleepless all that week waiting for the Trolls. Then the crypt noise started up again. I would put a pillow around my head and then I noticed that the vibration of it was even running through our bed. I sat up and my bedroom door stood wide open. I could see the hallway (There was light from the kitchen.) Above the hall was a swamp cooler vent (it was winter, so it was not on.) 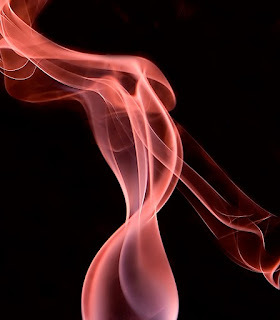 A thick bright neon pink-purplish smoke wafted down from the vent. I shook my husband and my eyes must’ve been huge in my face. He sat up with a frustrated sigh. “What?” I motioned my head towards the open door. We sat and watched this bright Pink smoke that did indeed look like the smoke from that old TV series ( I Dream of Jeannie.) It spilled in from the vent and filled the hallway and it smelled just like firework sulfur. My eyes even ran with tears at the painful stench of it. It rolled into the room, thick and almost solid looking. It rose to the ceiling and our heads drew all the way up to look at it. It began to take shape before our eyes. We heard laughter, the troll’s laughter. This shape was of a man, but he was so large that he had no head. It was like his head must be through the ceiling as all we saw was a neck up that far. My husband flipped the bedside lamp on. There was nothing there. There were all sorts of noises, laughter and banging, booms etc. every night for the next month and it would all start with the Crypt sliding noise at exactly 2 am. Sharp. The pink specter-Jeannie would appear often. Every time we flipped the light on? He would disappear. My husband plugged in a spot light and would use it when he appeared. He had noticed that when the storms would start, (for it was now spring and there are thunderstorms in N.M.) That there was no activity from this entity; He devised a plan, based on a theory that the Jeannie did not like electrical energy from the lightening. He split an old electrical cord and stuck one side into an electric outlet plug and we would hold onto the ends to get “charged.” The scraping got louder and even sounded angrier, but he did not appear. It got quiet and we finally could sleep at night. One night, I felt movement on the bed and turned my head on my pillow. My husband was choking. I sat up with confusion. There was this giant hand around his neck. His face turned purple and his eyes rolled back. I hit it with my hands, picked up a pillow and hit it. I screamed with pure, terrified panic. My husband’s sounds of choking were getting louder. I looked for the spotlight and my shaky hands flipped it on. It was unplugged! I screamed with panic and crawled around the bed to plug it in. There were the trolls, their faces grinning at me with ugly evil grins. I drew in my breath in, crawled forward, plugged it in and stood up, swinging the light to my husband. The light fell on him. The hand disappeared and he gasped desperately for air. We so wanted to move as you can well imagine, but there was nothing available that we could afford. There were all kinds of incidents like messes made in the kitchen at night. Smashed eggs from the fridge on the floor, swamped in pancake mix. Water flooding from the sinks, cabinets cleared out and everything thrown in the floor. Missing keys, missing brushes, missing shoes and then to find the missing items all lined up on the kitchen table. My husband, “Mr. Logical” says. “You really need to keep those kids from running amuck around here!” I would yell back as I was cleaning another morning’s mess. “It’s the Dammed TROLLS!” Then one night we were finally sleeping. There was a metallic bang on the outside of the mobile, right outside of our bedroom wall. Then another bang and another; these bangs grew loud and spread along the outside of the entire mobile. We got up and peeked out of our window. My husband believed it to be young kids trying to scare us. I thought. Oh, yeah? After what we have been through? “Well, they’re welcome to try...” I replied. We laughed nervously and continued to look out of different windows throughout the house to catch them at it. We saw no one and nothing. The metallic banging grew so loud that I covered my ears and the trailer shook. It was now on the roof. We looked at each other and knew that they could not be on all sides; the full length and on the Fricking roof, all at the same time! It went on for at least ten minutes. I went to comfort my kids. It all stopped suddenly. There were no more incidents after that. Something cleansed our mobile? The Evil Jeannie got mad and made noise before he left? We will never know, but I’ve never looked at that smoke from the little bottle on “I dream of Jeannie” in the same way ever again. Great story, Leanore! And very scary! Wonderful story from a talented storyteller! Happy Friday the 13th Leanore - thanks for sharing the story with us! Leonore - Wow, what a spooky & super creepy thing to have happened. Most people just don't know that paranormal stuff is real.